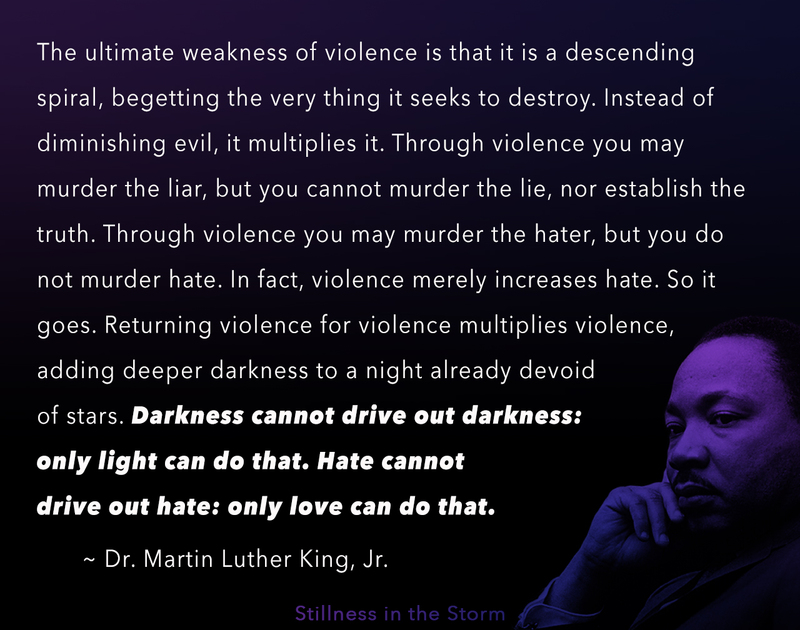 (Stillness in the Storm Editor) The question of how to deal with racism, bigotry, and intolerance is one that many have asked of late. Often the response to hate and intolerance by so-called social justice warriors is to spew out more hate and intolerance. But as Dr. Martin Luther King said, "Hate cannot drive out hate: only love can do that." The following is the inspiring and exemplary story of Daryl Davis, who lives out this principle of love conquering hate. He successfully helped hundreds of KKK members leave that racist organization, not by ranting and raving at them, but by getting to know them with loving acceptance for who they are. 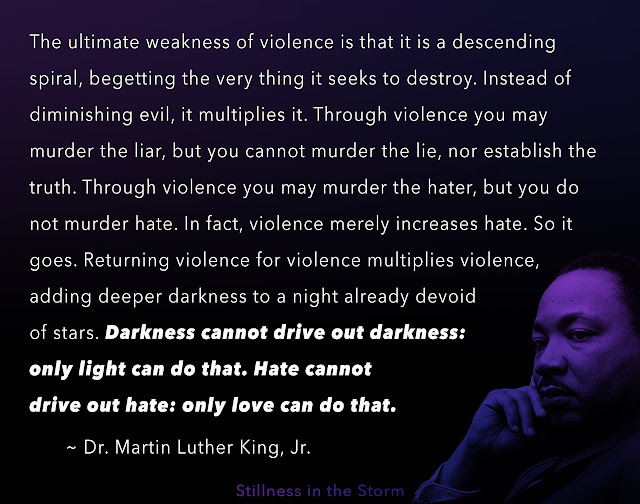 In effect, Davis uses the masterful skill of loving thy enemy as a way to dispel the often culturally programmed hatred within the minds of KKK members. Usually, a bully uses antagonism to invoke a defensive reaction in their victim, causing them to attack the bully, which then feeds more antagonism. According to Davis, he simply wanted to know why people who never met him were so hateful. Davis, in a humble and peaceful way, merely asks why. In one instance, Davis played some piano for a member, who was taken aback by how well Davis played. That became a point of safe ground for them to have a discussion, which eventually led to the man leaving the KKK. Firstly, that most people swept up by prejudice have no first-hand knowledge of why they hate what they do. They are told by various people that one group or race or person is unacceptably bad, and they should be hated—which they believe it without question. In essence, racism and prejudice is a kind of social dogma, and like all dogma, once the truth is experienced, the lie dissolves. Secondly, if a person's prejudicial leanings are based on dogma, then they likely possess a value system that is largely subconscious, meaning they don't know why they value what they do. They effectively become a bully who acts on the impulse to hate. And as was just discussed, if one were to use subtle communication methods that are kind and inviting with a bully—ignoring their offers of antagonism—the energy of hate and anger would quickly dissipate. Davis has mastered the art of non-confrontational communication, acting as a kind of antagonist whisperer who can induce calm and tranquility in the minds of those who claim to hate him for his race. For those in the awakening community, seeking to help others wake up and join the freedom movement, we would do well to take the moral of this story in hand. Far to often, people meet antagonism with antagonism, hate with hate, and intolerance with intolerance. But this rarely—if ever—creates a safe space where people feel willing to consider new ideas or work together to overthrow the criminal controllers. Thus, learning non-confrontational communication could be one of the most important things we as an awakening community do. It could literally be the thing that turns the tide and allows the now divided awakening masses to unite for global change. Personally, when I was reviewing this story, I was overcome with excitement knowing that Davis' wisdom might be a key to making progress towards the goal of truth, freedom, and justice for all. When one is largely motivated by and sees the world through emotions we can't use anger and antagonism to reach them. The fight or flight response kicks in, and their mind is shut against the world. But love really does seem to be the answer to this dilemma. (John Vibes) “Darkness cannot drive out darkness, only light can do that. 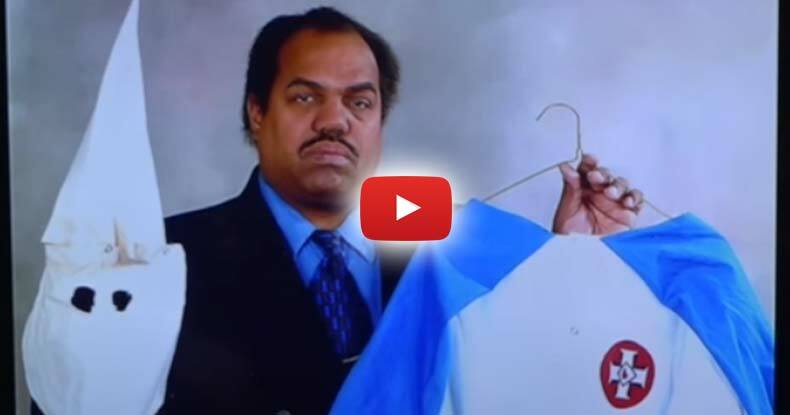 Hate cannot drive out hate: only love can do that.” – Dr. Martin Luther King, Jr.
58-year-old blues musician and author Daryl Davis has taken an unusual approach to racism, and has managed to successfully convince hundreds of racists to quit the KKK. Davis goes far behind enemy lines to Klan rallies and meetings of white supremacists to make friends with people who hate him for no reason and he’s been doing it for over 30 years. He is even responsible for single-handedly causing an entire chapter of the KKK to dissolve in the state of Maryland. Related All Lives Matter -- Racism, Bigotry, and Prejudice is a Human Issue | Cabal Divide and Conquer: Black Lives Matter: Produced by George Soros? Years ago, Davis began seeking out members of the KKK so he could learn more about racism first hand, straight from the horse’s mouth. He never actually sought out to convert any KKK member or change their mind. In the beginning, his initial goal was just to try to gain some type of understanding for why these people believe what they did. Davis is not a total pacifist, though, and is prepared to defend himself at any time. On at least two separate occasions he was attacked by Klan members and had to beat them up for his own protection, but he does not go anywhere looking for a fight. ‘There have been some incidents in which I was threatened and a couple of instances where I had to physically fight. Fortunately, I won in both instances,” Davis said. ‘These things happen from time to time, but it is to be expected because you are dealing with someone who hates you and wants to be violent just because of the color of your skin. Some of them are absolutely repulsed when they see a black person and want to hurt that person. At the core of it, although they won’t at first admit it, they express superiority, but truly feel inferiority and in order to elevate themselves, they have to push someone else down,” he added. Most often, though, these meetings happen without any incident, and while there are plenty of tense moments, the interactions between Davis and the racists that he encounters are surprisingly pleasant. Instead of focusing heavily on race and areas of disagreement, Davis instead tries to focus on areas of agreement and steers the conversation in a direction where both sides have common ground. “If you spend just five minutes with your arch enemy, you will discover that you have something in common, and if you spend ten minutes, you’ll find you have something else in common,” he says. Humor, friendliness, and music help Davis break the ice with those that he encounters. “I quickly enlightened him as to the origin of Jerry Lee’s music and told him that Jerry Lee had learned that style from black Boogie Woogie and blues piano players. The man did not believe me, despite the fact that I further told him that Jerry Lee was a good friend of mine and he had told me himself where he learned that style. But, the gentleman was fascinated with the idea that a black man could play like that. He was curious and wanted to learn more about me. It was then revealed to me by him that he was a member of the Ku Klux Klan. Over time, he and I became good friends. He ended up leaving the KKK,“ he added. Davis has a closet filled with Klansman uniforms, all of them given to him by friends and former Klansman who quit the racist cult as a result of their friendship. One KKK member and Baltimore City Police officer even gave Davis both his Klansman uniform and his police officer’s uniform. “I was very well prepared for the meeting in terms of knowledge of my topic. I have just about every book written on the Klan and I’ve read them all. In fact, I know more about the KKK than most Klan members know about their own organization. Knowledge, information, wit, and the way you disseminate these attributes can often prove to be a more disarming weapon against an enemy or some with whom your ideology is in conflict, than violence or lethal weapons,” Davis said. Davis does not push strongly for people to renounce their ways, and he does not lecture them about the ills of bigotry, instead, he simply shows up to learn and make friends. “It’s a wonderful thing when you see a light bulb pop on in their heads or they call you and tell you they are quitting. I never set out to convert anyone in the Klan. I just set out to get an answer to my question: “How can you hate me when you don’t even know me?” he asks. “I simply gave them a chance to get to know me and treat them the way I want to be treated. They come to their own conclusion that this ideology is no longer for them. I am often the impetus for coming to that conclusion and I’m very happy that some positivity has come out of my meetings and friendships with them,” Davis said. Surprisingly, Davis gets a fair amount of criticism from people of his own race, for mingling with the enemy. “There was surprise and shock on both sides (black and white), mostly from people who don’t know me, or who haven’t bothered to research me, read up on me, or hear my interviews or lectures. Not all, but most of the criticism has come from black people. I have been called a ‘sellout’, ‘Uncle Tom’, ‘Oreo’ and a number of other terrible names,” Davis explains. “Unfortunately, I must compare these particular black people with the KKK and other white supremacist groups, with no distinction, other than the color of their skin. This is because they are engaging in the exact same hateful behavior as they accuse the white racists. I can explain it like this because I’ve seen it on both sides,” he says. In a recent Interview, Davis discussed the coming Trump presidency and said that despite the racial tension in the media, he believes that race relations are better than ever. “In Israel, it’s Palestinian versus. Jew. In Lebanon, it’s Christian versus. Muslim. In Iraq, it’s Sunni Muslim versus Shiite Muslim. In certain African countries, the conflict is tribal. In India, we see a caste system based on the shade of skin color and classicism,” he explains. “There has always been a great deal of racism in the U.S. before and after Obama. However, racism in the US is down, post-Obama.What you are seeing is those people who were dormant racists, being given a new lease on life by the sentiments of our new President-Elect. They celebrate his election. But, let me be clear here. Every racist I know, and I know a lot of them, voted for Trump. However, that does not mean that everyone who voted for Trump is a racist. I know a lot of people who voted for him who are not racist,” he added. One thing that is worth mentioning in relation to racism and the popularity of Trump, is the fact that being hyper-vigilant about shaming any instance of real or perceived racism, seems to actually embolden racists, and even push moderates towards adopting racist views. This is a dynamic that many credit for Trumps rise in popularity. Davis takes a contrasting approach that seems to have more of a positive and lasting effect. John Vibes is an author and researcher who organizes a number of large events including the Free Your Mind Conference. He also has a publishing company where he offers a censorship free platform for both fiction and non-fiction writers. You can contact him and stay connected to his work at his Facebook page. John is currently battling cancer naturally, without any chemo or radiation, and will be working to help others through his experience, if you wish to contribute to his treatments please donate here.